Going on a camping trip soon? Are you planning a family camping trip? If you are new to camping, or haven’t camped with kids before, follow our simple tips to make sure you – and they – have a great time camping. As any seasoned camper will tell you, it is all down to the preparation. Making sure you have thought of all the essentials beforehand is the best recipe for a relaxed and fun time at your chosen camp site. Do your homework and make lists of things that need to be done before you go, rather than deciding at 4 pm on the Friday that you will go camping that weekend. Once you are an old hand, many things will become much easier to organise quickly. It is worth spending some time checking the facilities provided by various camp sites in your chosen location, or to ask friends for recommendations. Campsites that are geared up for family visits often have handy facilities that will allow you to leave surplus baggage at home. Make sure your chosen campsite is not next to a busy road if your kids are small. 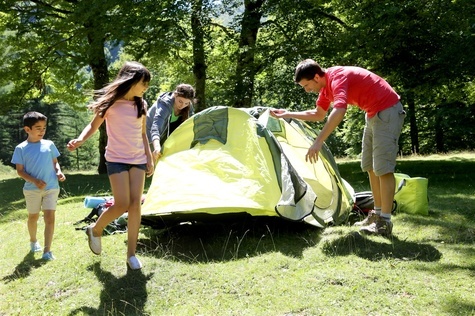 Camping can be twice as much fun with friends, both for the kids as for the parents. If you can, why not combine forces with other members of your family, good friends or fellow parents? The kids will enjoy exploring with their friends, and you will have company for around the camp fire when the kids have gone to bed. Make sure no-one gets bored on a rainy day by packing some board games, and make sure that you have a lean to or covered area outside your tent – or rig one up with a good-sized tarp and some rope - so that you can put the table and chairs under it and everyone can sit outside but out of the rain. Before you go, have a chat with the kids and let them suggest some camp chores that they feel they can do such as fetching water or firewood (check local regulations about camp fires) or helping with preparing meals. They will enjoy being involved and feeling useful and you will not have to worry about them wandering off too much while you are getting things ready. Make sure you teach your kids about safety from their very first camping trip. That way, you will find it easier to relax and after a few times, they will know exactly what is expected of them too. Agree which areas are out of bounds, or whether they have to stay within your field of vision. Don’t be over-protective and don’t worry too much; falling in a muddy puddle or scraping a knee are all part of outdoor life. If you ask grown-ups about camping memories from their childhood, you often hear “we always…”. It can be anything, from sharing songs around the camp fire to a certain food or even a favourite location. Kids love knowing that there is something special about the holiday, something that would not happen at home. Even though your kids may not like the idea, some firm rules about screen time will make your trip more enjoyable. Once they get out of the habit of boing on their phone or tablet and remember the fun there is to be had in the woods, on the beach or by the river, they will thank you for it – honest! 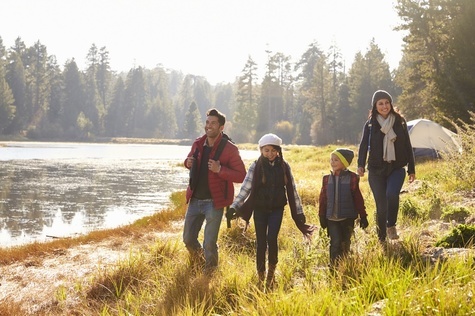 Make sure that you take time to play ball games with the kids, explore or go on hikes together. The reason you decided to go camping was to be outdoors, spend time together and create new memories, so make sure you make the most of your time together. Camping with kids us great fun but can be exhausting. All that fresh air, activity and “making do” means you ned a good night’s sleep. Make sure that you have enough room inside the tent for everyone to stretch out and not step on each other when moving around during the night, bring a comfortable air bed or camp bed and maybe even bring pillows and a quilt from home rather than struggling with sleeping bags. 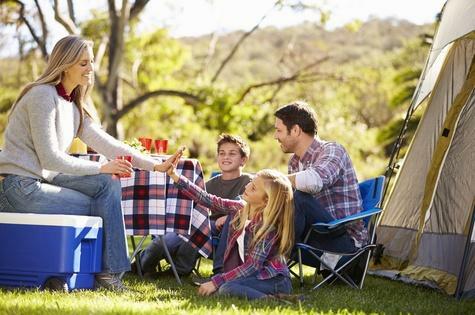 For a great range of family tents and other camping essentials, check out the Anaconda website where you will find everything you could possibly need for your family camping trip. This forum needed shinkag up and you’ve just done that. Great post! I can’t hear antyhing over the sound of how awesome this article is. Be prepared wherever you go!